Welcome to the High Desert Dwell! In walking distance to all of the best of Bend, the location is exceptional. Walk a couple of blocks to Chow (the local’s fave! ), Kanpai Sushi, Spork, and all of the fun shops, bakeries, coffee, pubs, and restaurants on Newport Avenue. Stroll through the Westside neighborhood and you are in Drake Park and downtown Bend in minutes. Or, hop on a cruiser bike and explore town like a local. Getting to 10 Barrel Brewing, the hub of the Bend Ale Trail, is an easy meander. The Old Mill and Les Schwab Amphitheater are easy to access by bike or a longer walk. Boasting a spectacular architectural layout, this home has an open floor plan with high ceilings, windows, and plenty of sunshine throughout. Enjoy the comfy and hip upscale modern-contemporary decor with artistic touches and treasures. Cozy up to the gas fireplace and watch a movie on the HDTV. Enjoy the beautiful hardwood floors, central air and sliding glass doors that open out onto the patio. The master bedroom features a new, high quality King bed with European style bedding, high thread count linens and a clean, fluffy down duvet. There are gorgeous linens and down duvets in the two other bedrooms. Cook an unforgettable meal in the fully equipped gourmet kitchen and sit down to dine with family and friends. Or, step out onto the patio and enjoy outside living “Bend style” while you and your friends cook out on the Weber gas grill. • Unbeatable Westside Location, WALK EVERYWHERE! We had a wonderful stay in this lovely unit. The location is great, and the unit is new, clean, beautifully furnished and very comfortable. The kitchen is well stocked with whatever you might need (pots/pans/spices/coffeemaker and first day coffee pouch). The Newport Market is within walking distance, as well as numerous cafes. Its a quiet neighborhood. We loved it and will return! Super house in a great location! This house is as advertised. Very clean, comfortable and in a great location. Walking distance to amazing restaurants and breweries, close to epic mountain biking, etc. We will stay here again. Super Clean, Modern and in a Great Location We had a great stay at this home. I am often disappointed with the cleanliness of rentals but this house was super clean and well stocked. The kitchen had everything we needed and the bedding and linens were top notch. The house is new, modern and nicely decorated with clean lines. It is walking distance to downtown and to 10 Barrel & other many other brewpubs. There is a great grocery store, bakery & coffee shop all within a couple of blocks. There is a magnet school across the street but it was no concern at all. It is a cute little school and better than looking at someones house. I am glad we found this house and a rental agency that takes such great care. We plan on returning many times. Our family of 4 plus our cousin stayed here while skiing and sledding on Mt. Bachelor. This is a great location. Quiet neighborhood, central to everything including the Old Mill, Downtown Bend, and the Mountain. It was also a convenient 2 block walk to Newport Market which is a fabulous place to shop for groceries and kitchenware goodies. The house is perfect for a family or 2 couples (maybe 3) traveling together. Spacious rooms and nicely furnished with all the amenities necessary. Very easy check in/check out and great communication from the host. There was a ridiculous amount of snow in Bend this season but the walk-way and side path to the house were cleared! Take the time to study the map in the master bedroom. Even as Oregon natives, we were mesmerized by its content. Wed love to come back for our annual trip next year. Home had a lovely atmosphere with a really comfortable and spacious, but also warm and cosy living area. Whole house was immaculately clean and modern with a great design. Beds were very comfortable Top location. Our family of six adults and one baby had a wonderful week here while skiing at Mt Bachelor. Bluebird Days place was just as pictured and described. It was beautifully appointed, clean and conveniently located. We were traveling with my parents and our son, and all 5 of us were every comfortable in the space, which was important given that it rained all weekend -- keeping us indoors more than we expected. The place had everything we needed, and it was close to some great restaurants and breweries. Everyone at Bluebird Day was responsive, professional. They made check-in and check-out super easy and clear. Looking forward to another trip to Bend when the weather is more cooperative! The house is awesome and in a perfect location. The house is clean and really functional. We loved our stay at this home! There was plenty of room for our family of 4, and the management company was really accommodating and helpful. The house was spotless and perfect for our needs!! Its in a great neighborhood; you can walk to a grocery store and a ton of great restaurants, as well as the river and the Deschutes Trail. We will definitely be back and highly recommend this home! Great house and great people to rent from! Perfect place if your going to do a weekend at Bachelor. It was perfect to walk or ride bikes (included) for dinner or drinks in the area. Great layout inside. The Master Bedroom was beyond spacious with a great shower. Kitchen and Living Room were great. Also Netflix was an unexpected bonus. Id recommend Bluebird Day if your headed to Bend. This house was the perfect fit for a family getaway to Bend. The house was pristine and the general openness of the layout allowed for everybody to hangout with one another quite easily. Really great use of space! Its close proximity to Mt. Bachelor was great for a skiing family like my own, and the ability to walk to some of Bends best and most lively restaurants was quite nice. Rebecca was very attentive and was sure to let us know that if we needed anything at all, she was available to help. Of course, everything was so well organized and in great shape that no help was needed. We will definitely be coming back to stay here next time we are in Bend! This house is pretty much brand new and in the best location of town to explore Bends best breweries and parks. You can ride your bikes to anywhere and you have great restaurants and markets within walking distance. Highly recommend this property for a family or a fun adult weekend away! We had a wonderful winter stay at the house. The house itself is great. And the location in a nice, walk-able neighborhood with easy access to the restaurants/shops of West Bend and downtown was perfect. We enjoyed running along the Deschutes river trail and skiing at Mt Bachelor. Looking forward to coming back next winter! My family and I stayed at this wonderful Bend, OR house last summer and we had the most wonderful stay. The house is brand new and is decorated impeccably. It has everything you need to be comfortable and is across the street from a playground which is awesome if youre traveling with little ones like we are. 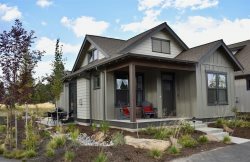 The house is in walking distance from downtown Bend as well as many great restaurants and shops. We cant wait to return to Bend and well definitely stay here again. Brand new fully equipped house is great, and location is amazing. Walk to town, market, restaurants and parks. We loved it. We stayed at the Lex House this past spring and had an amazing time. The house is gorgeous -- pristine, well-located (out kids would have been happy playing at the playground across the street the entire time), well-laid out and super stylish. We wanted to move in. Lots to do nearby - we went mountain biking, hiking and skiing AND walked to delicious food each night. Will definitely return. We have stayed at the Lex House a few times and its a wonderful house in every way...very attractive, airy, well appointed, comfortable, clean and convenient to town, hiking, skiing and golf.